Peter Epp was born in Schönfeld, Bergthal Mennonite Settlement, Russia 6 December 1864 (O.S. 24 November), and came to Canada with his parents, Peter Kornelius Epp and Maria (Doerksen) Epp in October 1874 at the age of ten. He was the eldest of nine children. He married Katharina Wiebe (6 November 1863, Heuboden, South Russia - 27 August 1896, Manitoba, Canada) on 11 December 1883 and had eight children. After her death he married Maria Derksen (5 June 1868 [O.S. 24 May], Schönenberg, Russia - 4 February 1947, Abbotsford, British Columbia, Canada) in Altona, Manitoba on 8 December 1896. Maria, the daughter of Isaak Derksen and Maria (Penner) Derksen, was a widow with three children (her first husband, Bernhard Dyck, died in 1896). Three children were born to Peter and Maria. Peter died in Yarrow, British Columbia on 29 June 1953. Peter was baptized in the Sommerfelder Mennonite Church 10 May 1883. In 1907 he joined the Bergthaler Mennonite Church of Manitoba and was ordained for ministry 10 December 1911 in the Bergthaler congregation in Edinburg. Thereafter he served the Bergthaler Mennonite Church throughout southern Manitoba. When the Mennonites formed the Canadian Central Committee for Western Canada in 1920 in response to the needs of Mennonites in Russia after World War I, Epp became chairperson of the committee. It was probably due to Epp's influence that the Bergthaler Church played such an active role in the Russian Mennonite relief effort. In April 1922 the Canadian Mennonite Board of Colonization was formed and as a board member Epp was among those sent to Quebec City to meet and accompany the first group of immigrants to arrive in 1923. During this time Peter's wife Maria spent hundreds of voluntary hours preparing clothing shipments to Russia. Peter became the leading minister in the Morden Bergthaler Church when he moved there from Schoenthal near Altona in October 1923. 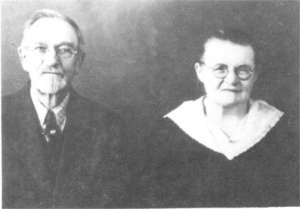 Epp was able to provide the stable leadership needed by the Morden group throughout the 1920s and Epp became instrumental in establishing the Bergthaler Mennonite Church in Morden in December 1930. Peter P. Epp served as the official leader of the congregation from 1931 to 1935. However, his influence began to wane in the 1920s with the coming of the Russlaender Mennonites to Manitoba. Epp's age and traditional approach to church life were eclipsed by the youth and new methods of men like Jacob M. Pauls, who had been ordained as minister in the congregation in 1932. It was ironic that the Russlaender, who had benefited so greatly from Epp's advocacy in earlier years, were now seen by him as the cause of considerable pain. Peter and Maria left Morden without farewell or fanfare and moved to the Fraser Valley of British Columbia in the spring of 1936. Here his retirement was interrupted when an Abbotsford group called on him to give leadership to the new United Mennonite Church of Abbotsford (eventually renamed West Abbotsford Mennonite Church). Epp led the congregation for three years through its early organization and the construction of a sanctuary in the fall of 1937. In 1939 Peter was able to hand over leadership of the church and again retire. Two months after their golden wedding anniversary his wife Maria passed away. She was a well-informed woman "who looked far beyond most of her contemporaries" (Gerbrandt: 187) and wrote numerous reports to Der Bote, Der Mitarbeiter and Die Mennonitische Rundschau. Peter P. Epp spent his last days in the Yarrow Old Folk's Home until his passing in 1953. Epp, Esther Ruth. "The Origins of Mennonite Central Committee (Canada)." M.A. thesis, University of Manitoba, 1980. Epp-Tiessen, Esther. Altona: The Story of a Prairie Town. Altona, MB: D. W. Friesen & Sons Ltd., 1982. Gerbrandt, Henry J. Adventure in Faith: The Background in Europe and the Development in Canada of the Bergthaler Mennonite Church of Manitoba. Altona, MB: D. W. Friesen and Sons Ltd., 1970. Loewen, David. Living Stones: A History of West Abbotsford Mennonite Church 1936-1986. Abbotsford, BC: West Abbotsford Mennonite Church, 1987. Milestones and Memories: Bergthaler Mennonite Church of Morden, 1931 to 1981. Morden, MB: The Bergthaler Mennonite Church, Morden, 1981. Peters, Gerhard. Remember Our Leaders. Steinbach, MB: The Mennonite Historical Society of British Columbia, 1982. Sommerfelder Gemeinde Buch, 1A and 1B. Ens, Alvin G. and Richard D. Thiessen. "Epp, Peter P. (1864-1953)." Global Anabaptist Mennonite Encyclopedia Online. January 2011. Web. 22 Apr 2019. http://gameo.org/index.php?title=Epp,_Peter_P._(1864-1953)&oldid=112893. Ens, Alvin G. and Richard D. Thiessen. (January 2011). Epp, Peter P. (1864-1953). Global Anabaptist Mennonite Encyclopedia Online. Retrieved 22 April 2019, from http://gameo.org/index.php?title=Epp,_Peter_P._(1864-1953)&oldid=112893. This page was last modified on 13 February 2014, at 06:38.